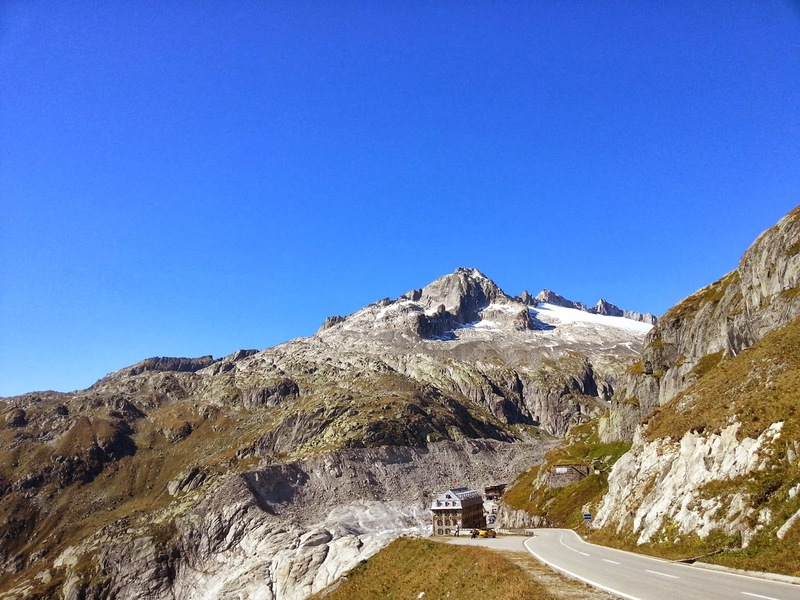 Cubo Viaggiatore: Day 3: Urka the Furka! 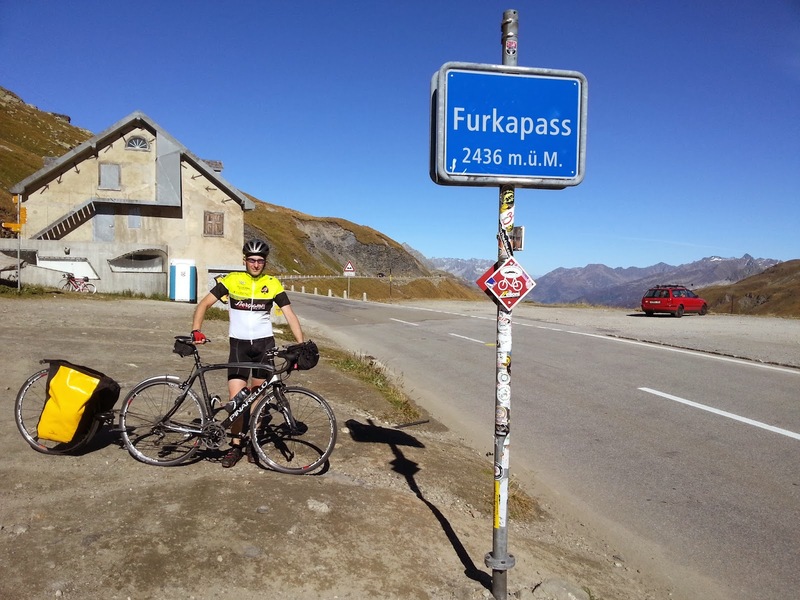 Day 3: Urka the Furka! Departure from Brig a bit slowly actually, I missed the wake up alarm, let me say not a good starting gun considering the long stage (140 Km with Furkapass to climb) I have in front of me ... it is holiday anyway. The breakfast is good and the hotel owner allowed me to prepare my sandwiches by myself using the breakfast buffet. To go out from the city of Brig was not so easy, because a problem (advantage from other point of view) that in this Swiss area there are roads on purpose for bikes, if you don't live here and if you don't know the area it is not easy to find them out. At the end anyway I went out from Brig using a beautiful small road along the Rhone river avoiding traffic. 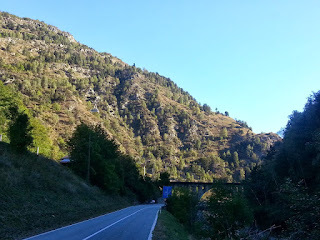 Outside the city I get back to the national road, there is traffic but not as much as the day before on the Simplon Pass road. 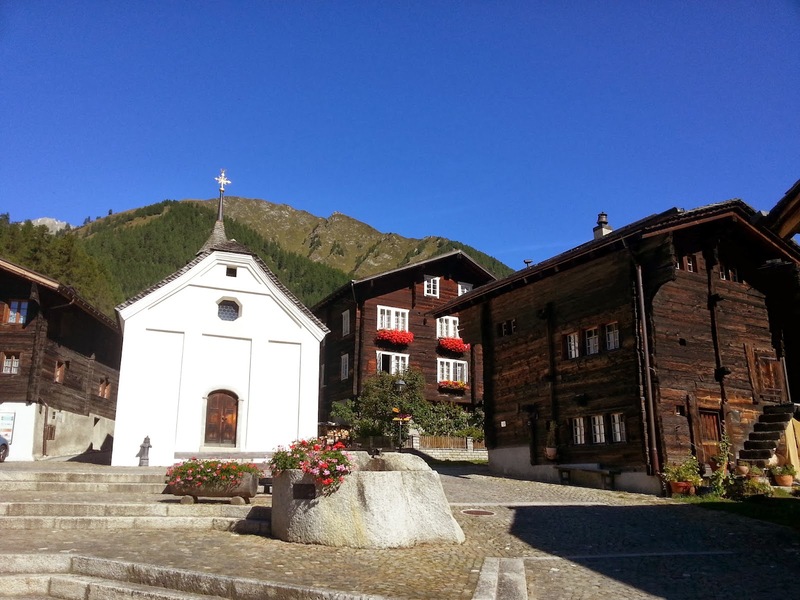 The way that lead to the Furka Pass along the Rhone valley is mainly uphill, the most interesting is that the valley come across delicious villages with wooden houses. I can often ride inside the villages following the shortcuts recommended by OpenStreetMaps (OSM). 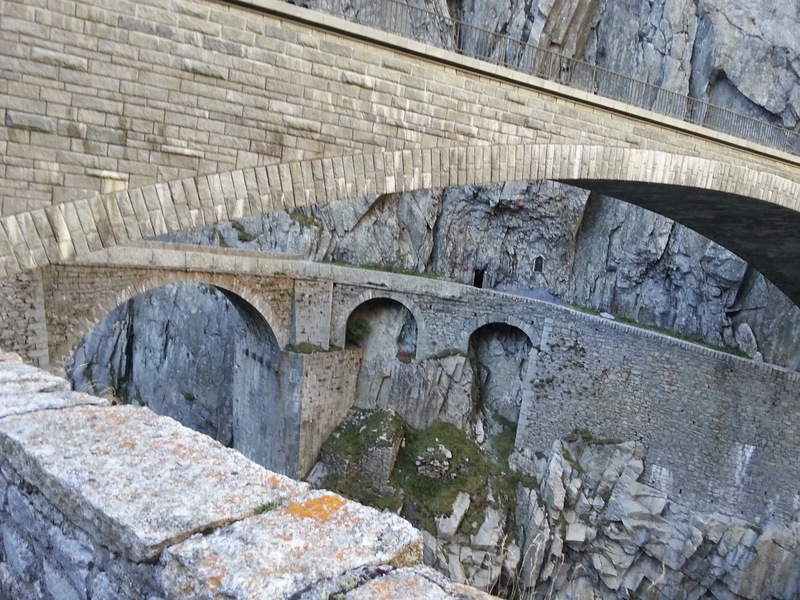 One of the most impressive part of this Rhone Valley is the mountain railway. 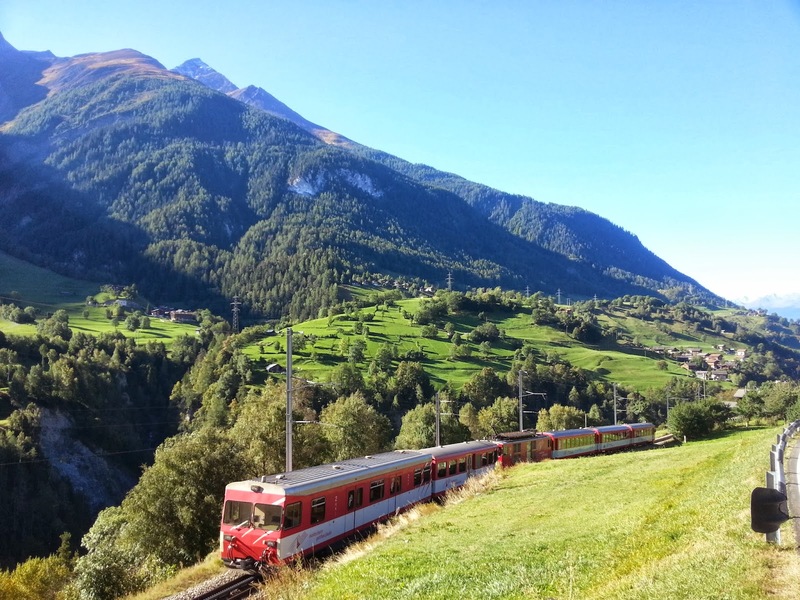 The train I think can be a suitable way for visiting the country it seems that, here in Switzerland, places in the meddle of nowhere are reached by railway. Sometimes in order to avoid tunnels I take the risk to get some tunnel side road, I'm not 100% they are leading back to the main road at the end of the tunnel, I always been lucky and I have never had to get back. 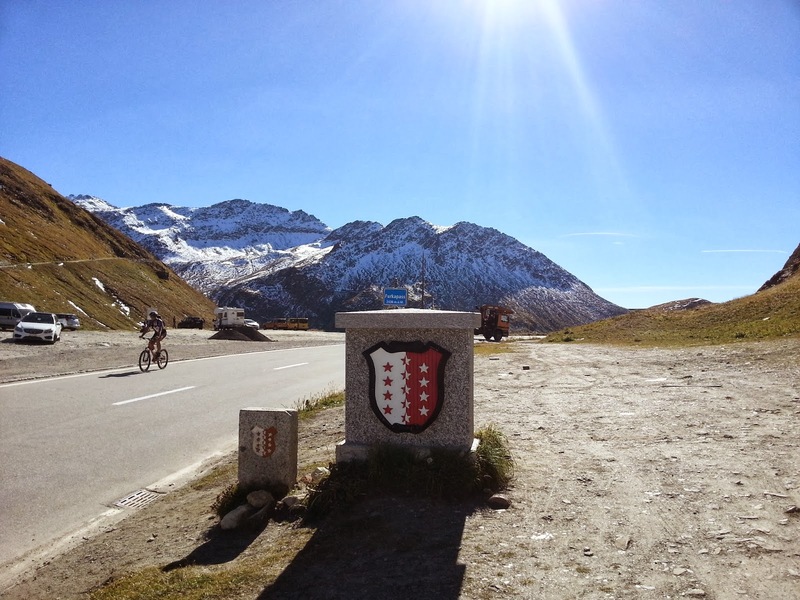 At half past 12, after having my first sandwich, I can start the uphill towards the Furka Pass, from the scenic point of view, since the beginning, it appears already spectacular. 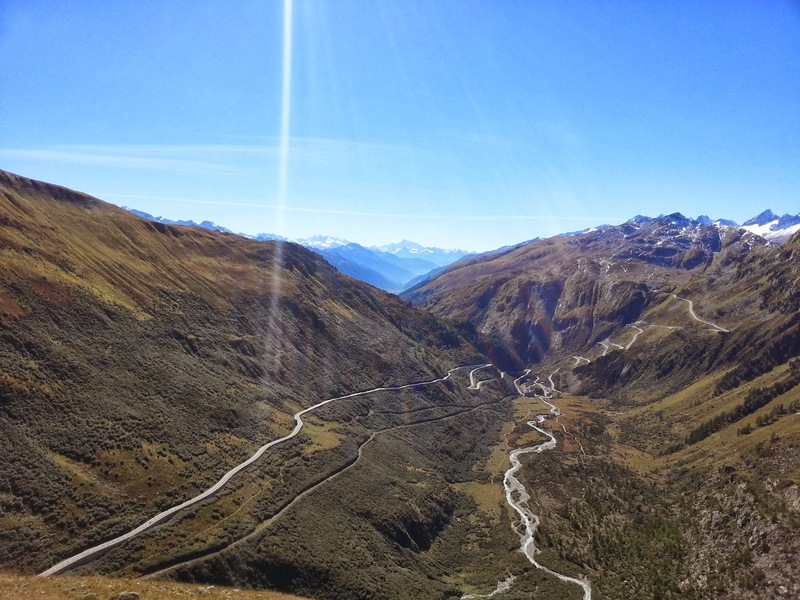 The first view of hairpin turns in front of me are from Grimsel Pass. I do not realize anyway as far as I'm in Gletsch where a junction indicate straight for Furkapass and left for Grimsel Pass. 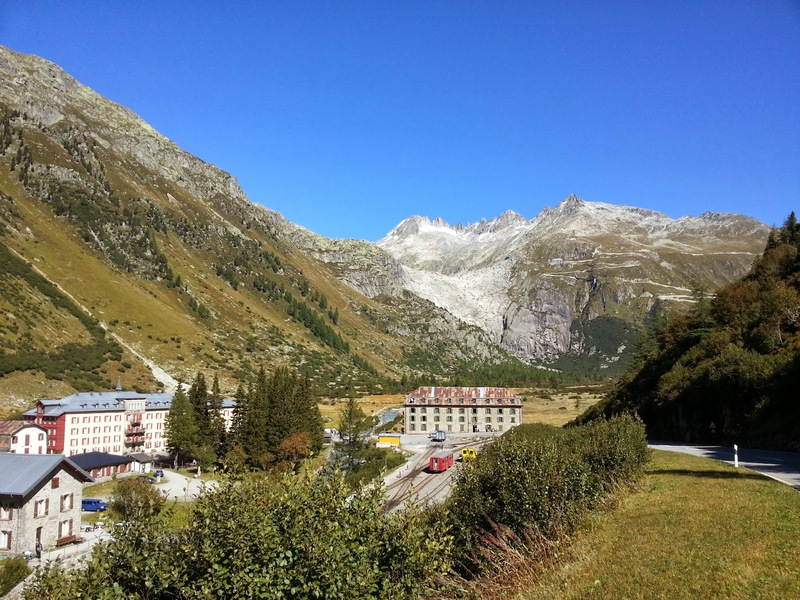 In Gletsch indeed I can see the whole greatness of the Furka in front of me. 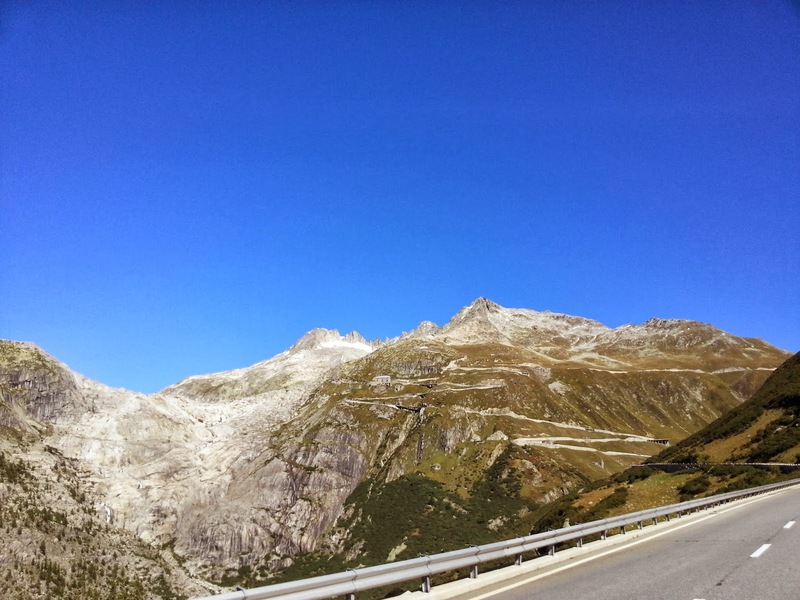 This is the view of Gletsch after the first ramps toward the Furka, the pass hairpins turns are visible on the background. 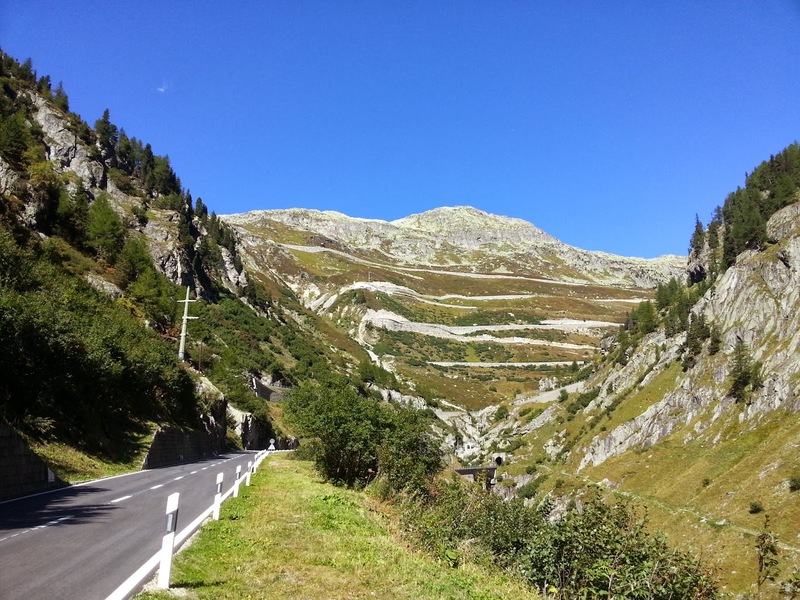 From Gletschs to the hairpin turns preceding the Belvedere Hotel the inclination is not too high never above 8%. 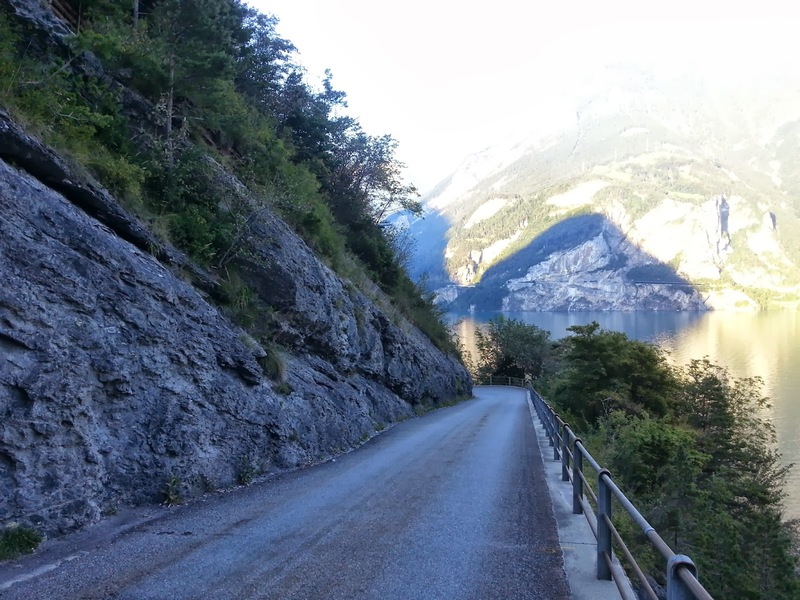 When the uphill arrives in the road below the Belvedere Hotel the road inclination gets up to 10-11%. 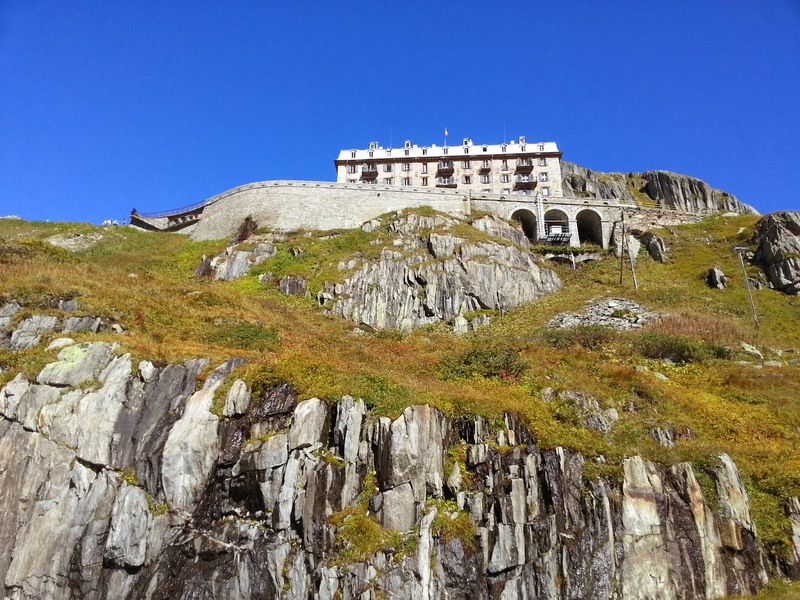 The view of the Belvedere Hotel a couple of bends below. 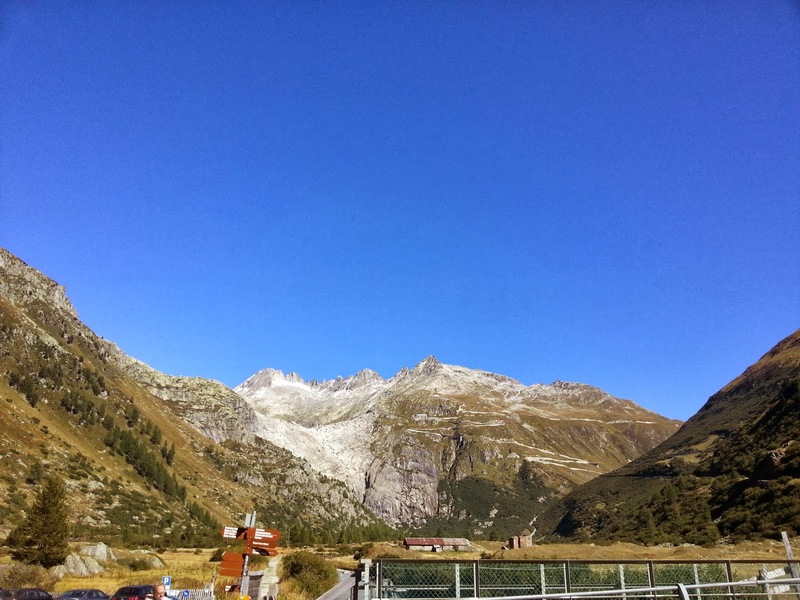 From the parking in front of Hotel is possible to visit the 100 meter long ice cave that allows you to take a look at the inside of the Rhone Glacier. Today in this area I met a lot of solo bike travellers as well. I noticed that mainly bicycle-travellers are men and often they are alone. In case there are bike solo traveller women reading please contact us and tells your stories on CuboViaggiatore. Today I meet a French bikers who is riding the route number 1 recommended by veloland.ch. (cycing in switzerland). Unfortunately today I cannot stop and chat too much because of the very tight schedule. I hope that the contact details I gave to him are enough to contact him in the future and hopefully to see the posts about his trip on CuboViaggiatore. 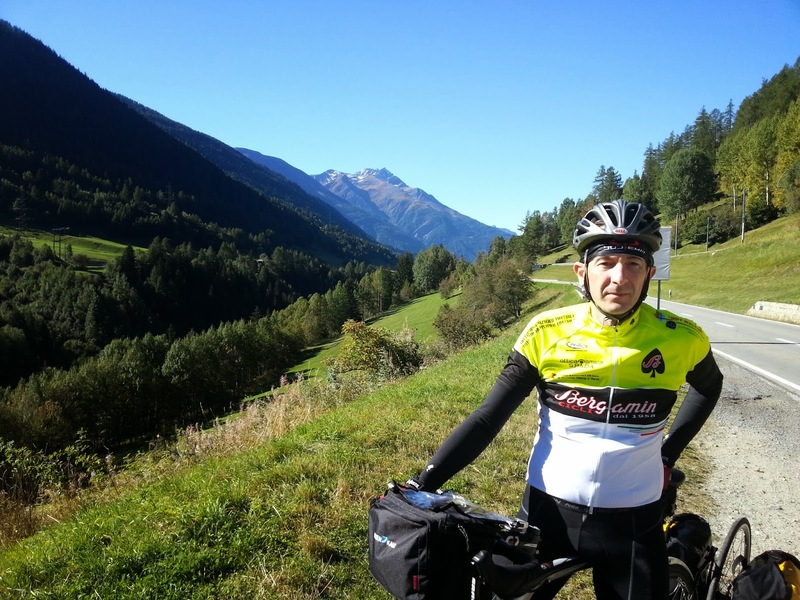 I was able to chat a bit with another French bike traveller at the top of Furkapass, I met the other bikers unfortunately when we were in different directions. The spectacular view from the top cannot be described using words, very lucky today, no any cloud in the sky. The ritual pictures on the Furkapass with the Cicli Bergamin T-shirt, that I proudly put on me in this adventure. It was a pleasure for me for many reasons, first for the many years of dear friendship with Danilo, the father founder of this shop and second for the great enthusiasm I received from Fabrizio & Co the day before my departure. Thank you Cicli Bergamin and Fabrizio for the support. 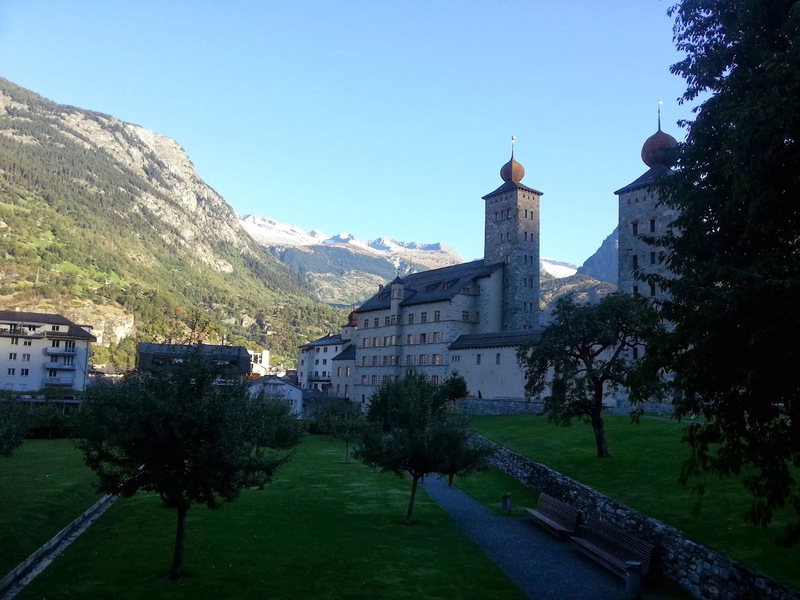 The dowhill is very long and continue even after Andermatt in the Reuss valley. The Reuss flows through a canyon here called Schöllenen Gorge up to the south branch of the Lucerne Lake. 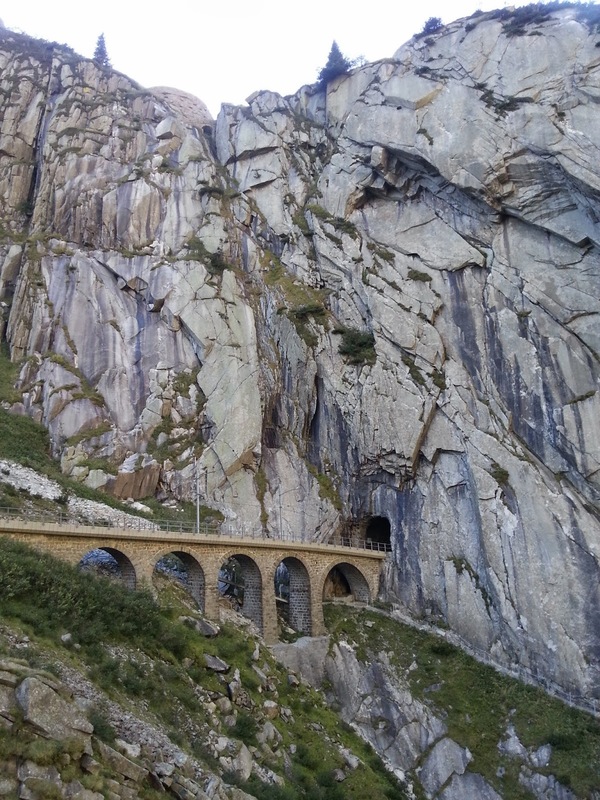 The gorge is 5 Km long and it is the way to access the Gotthard Pass. Along the Gorge thre are some possibility to avoid tunnels for cars, but the seem to be more suitable for Mountain Bikes than for a race bike. The area is full of bridges and tunnels the most famous is the Teufelsbrücke (Devil's Bridge) wher I can take one of the spectacular short-cut, as you can see in these pictures. Once arrived at the Lucerne Lake the stage is not finished yet. 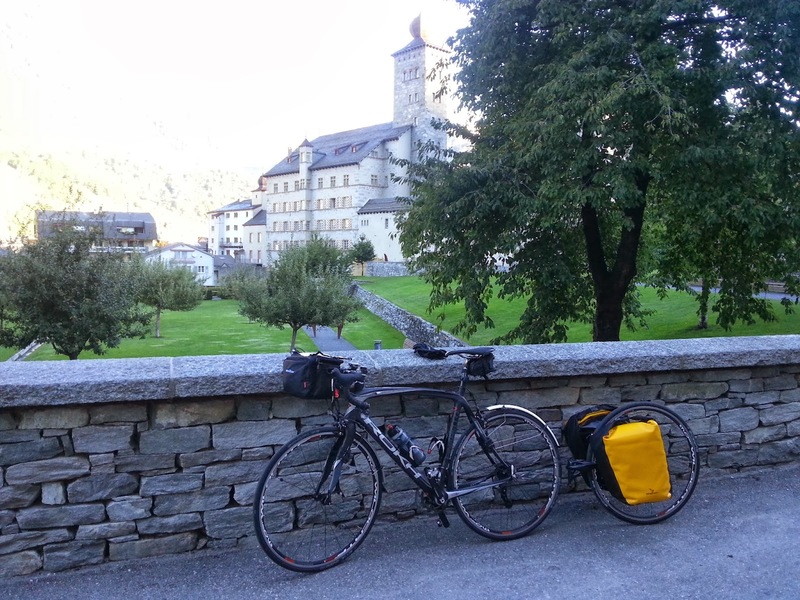 In Altdorf (capital of the Canton of Uri and famous for William Tell stories) I'm able to get in small cycling roads thank to the OSM advices. 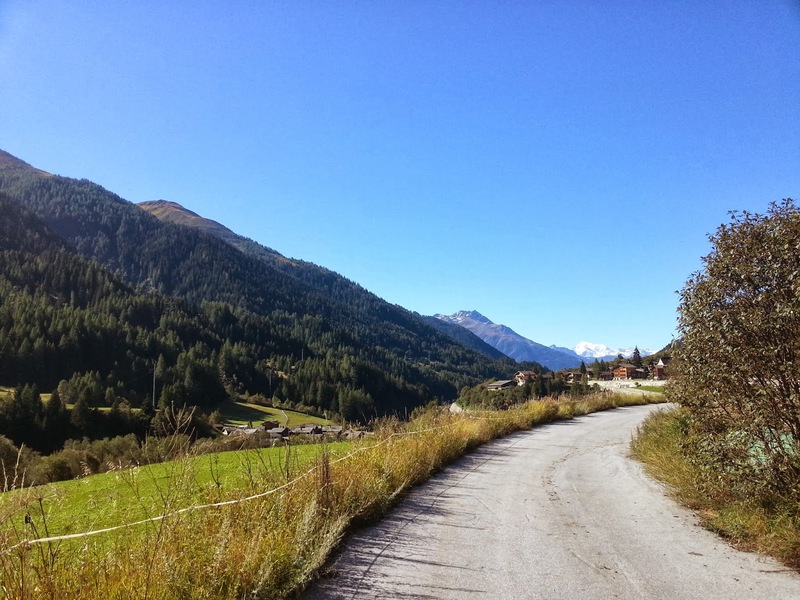 I ride the road along the lake on the west side because I have to get up to the small village of Isenthal. The last 4 km are a present surprise (ironically speaking). 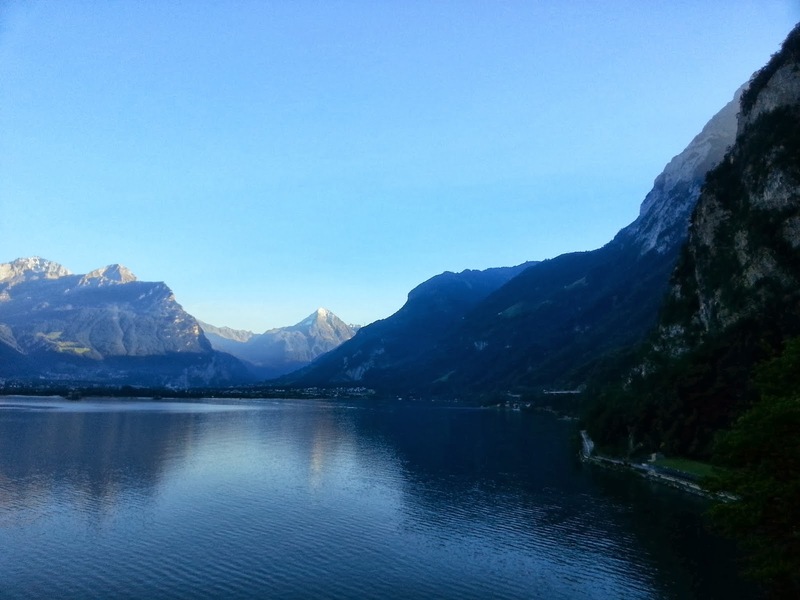 The uphill to the small village of Isenthal have 10-11% of inclination, the view is really beautiful, with the sunset on the lake, anyway for today I got enough of uphill. Initially I blame myself for the hotel choice, at the and I'm happy because the hotel is really worth. The owner is extremely kind, the food is really good and the room has the heating system switched on (this is not a negligible aspect considering that yesterday in BrigI was so cold). 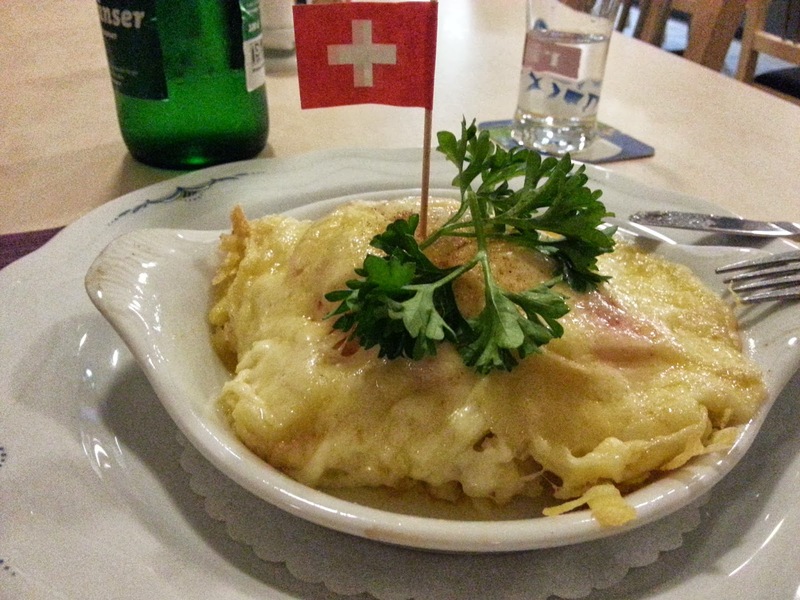 At dinner here I discover the Rosti one typical Swiss recipe. 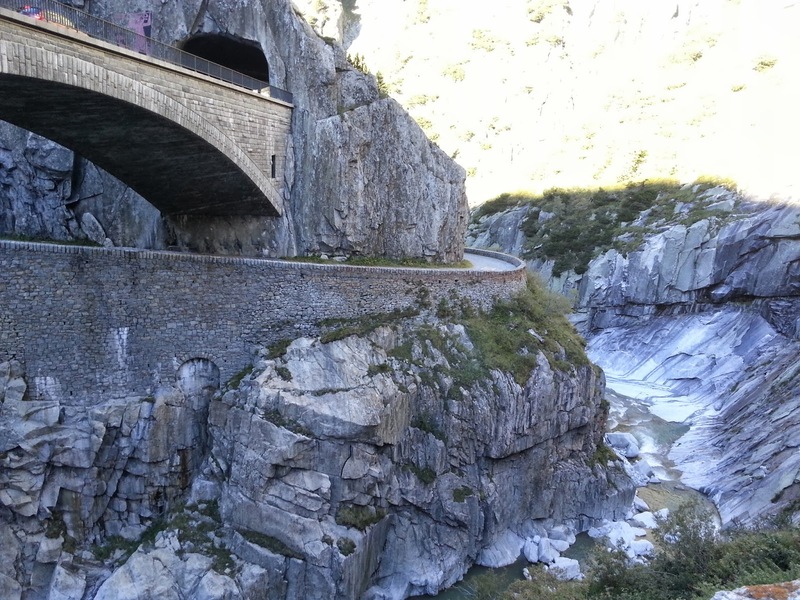 Some famous scenes of the third film in the James Bond series called Goldfinger in 1964 took place in this part of the Switzerland and on the Furkapass. Very interesting the following video where there is a comparison of the same areas showed in the film with how they appear nowadays.